This is Rich Kleinfeldt. And this is Sarah Long with THE MAKING OF A NATION, a VOA Special English program about the history of the United States. Today, we tell about slavery, and how it affected the history of the United States. Slavery is one person controlling or owning another. Some history experts say it began following the development of farming about ten thousand years ago. People forced prisoners of war to work for them. Other slaves were criminals or people who could not re-pay money they owed. In later times, slaves provided the labor needed to produce products that were in demand. Sugar was one of these products. Italians established large sugar farms beginning around the twelfth century. They used slaves from Russia and other parts of Europe to do the work. By the year 1300, African blacks had begun to replace the Russian slaves. They were bought or captured from North African Arabs, who used them as slaves for years. By the 1500s, Spain and Portugal had American colonies. The Europeans made native Indians work in large farms and mines in the colonies. Most of the Indians died from European diseases and poor treatment. So the Spanish and Portuguese began to bring in people from West Africa as slaves. France, Britain and the Netherlands did the same in their American colonies. 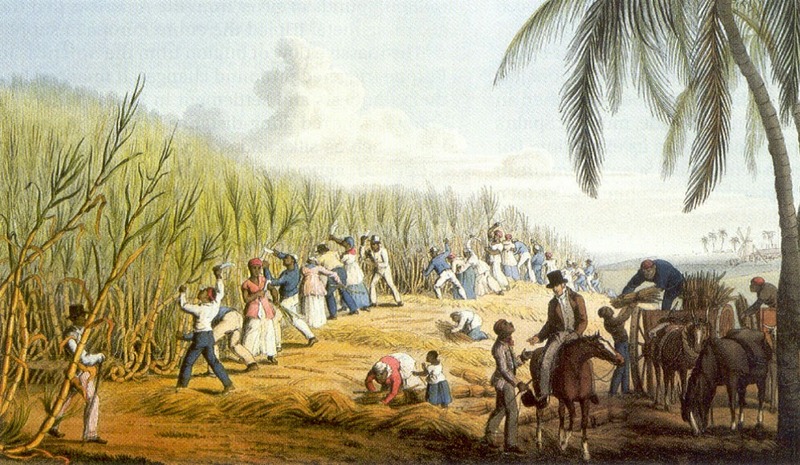 Many slaves lived on large farms called plantations. These large farms produced important crops traded by the colony, crops such as cotton and tobacco. Each plantation was like a small village owned by one family. That family lived in a large house, usually facing a river. Many separate buildings were needed on a plantation. For example, a building was needed for cooking. 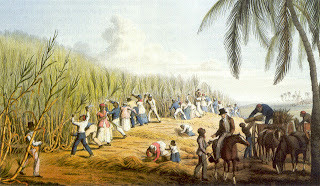 And buildings were needed for workers to produce goods such as furniture that were used on the plantation. Today, most people in the world condemn slavery. That was not true in the early years of the American nation. Many Americans thought slavery was evil, but necessary. Yet owning slaves was common among the richer people in the early 1700s. Many of the leaders in the colonies who fought for American independence owned slaves. This was true in the northern colonies as well as the southern ones. The New England shipbuilding towns near the Atlantic Ocean grew quickly as a result. The largest of these towns was Boston, Massachusetts. By 1720, it had more than ten thousand people. Only two towns in England were larger: London and Bristol. By 1750, almost twenty-five percent of the total number of people in the American colonies were black slaves. From the 1500s to the 1800s, Europeans sent about twelve million black slaves from Africa to America. Almost two million of them died on the way. This program was written by Nancy Steinbach and produced by Paul Thompson. This is Rich Kleinfeldt. And this is Sarah Long. Join us again next week for another Special English program about the history of the United States.